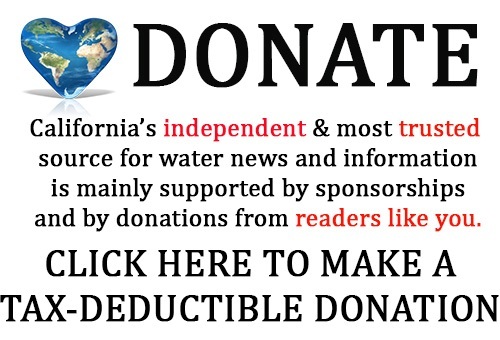 In 2013, the question was asked at a symposium at UC Davis, what does tidal marsh restoration actually do for these fish species, and some of the conclusions from that symposium were that there are information gaps that can be addressed by designing restoration projects as experiments, and the experiments can be approached in a way so that we can learn from them in the future. Adaptation. How is this actually going to be working? How do we do this adaptive learning? Is there some framework that we can use? Dr. Platenkamp then addressed each challenge more directly. 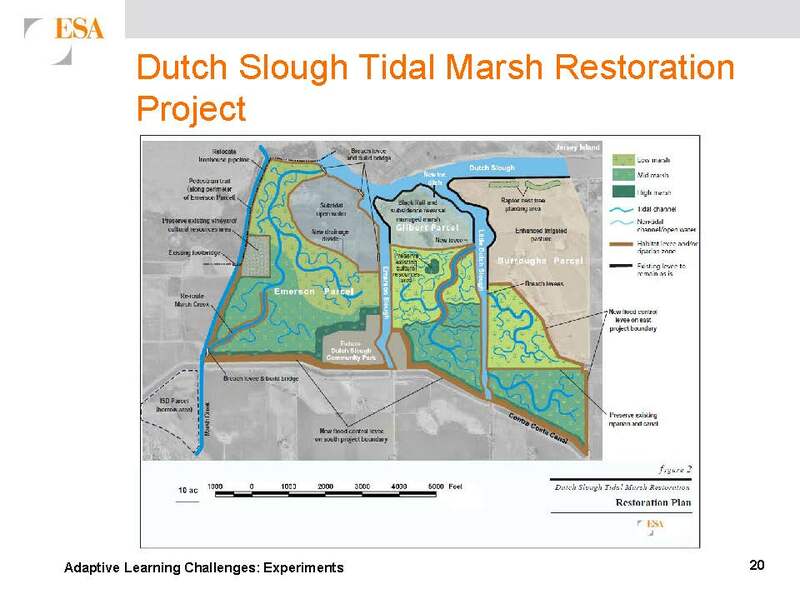 Dr. Platenkamp presented a slide of the DRERIP conceptual model for tidal marsh, and said he would demonstrate different ways these hypotheses can be used in design using three projects as examples: the Lindsay Slough Restoration Project, Dutch Slough, and the Tule Red Project in Suisun Marsh. 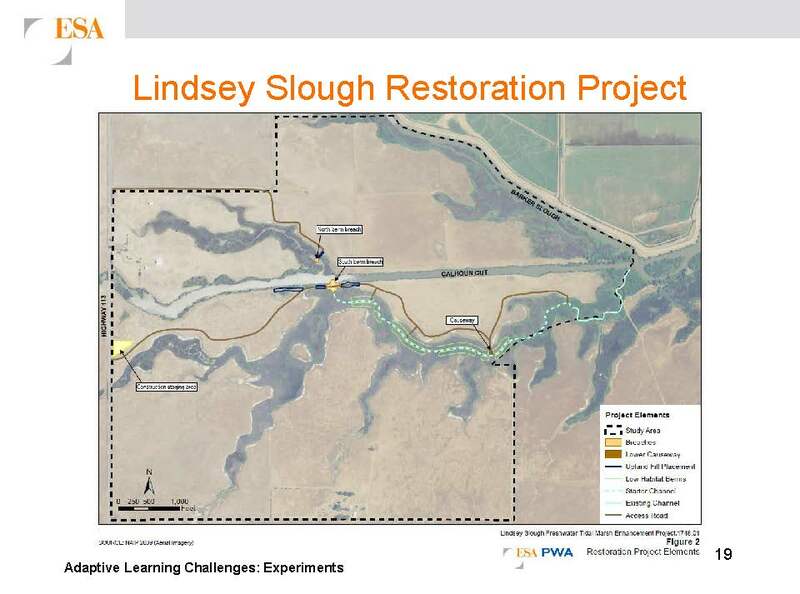 Dutch Slough: This project is much more complicated in its design. 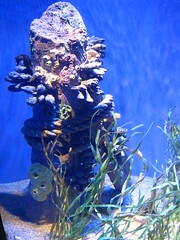 It has different sized cells – small, medium and large, as well as one really large wetland cell. One of the hypotheses to be examined is the effect of cell size or channel sizes in the wetlands. Also being tested is whether low marsh or mid marsh is more effective in providing benefits to fish species. Dr. Platenkamp noted that Bruce Herbold has put together a really outstanding adaptive management plan for this project. 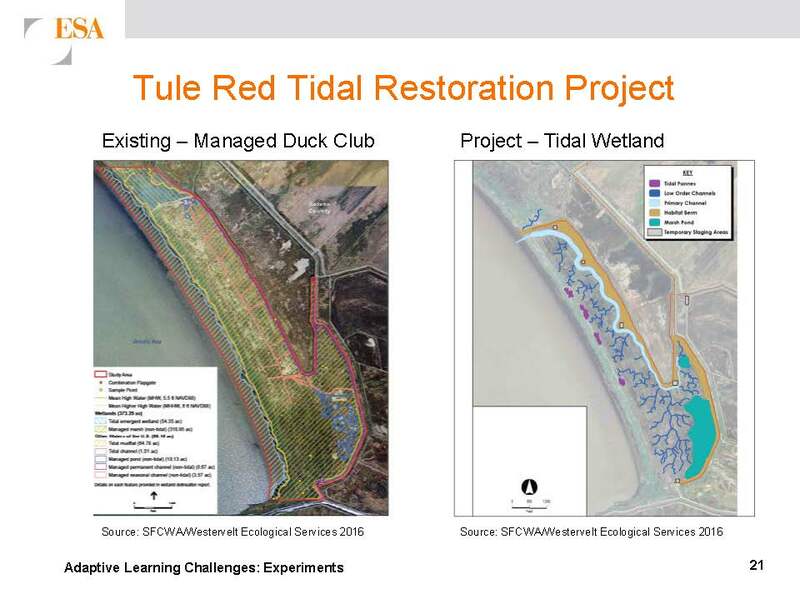 Tule Red Restoration Project: This project is a former managed duck club; there is a berm separating it from Grizzly Bay. The design, done by Northwest Hydraulics Consultants and Westervelt, is to create a breach through the berm and have smaller channels coming off of that, as well as having marsh ponds and pans. What happens is that they get inundated at very high tide, and so the water gets retained there until the next very high tide event, and during that time of longer residence, there’s going to be more productivity in those, said Dr. Platenkamp. Another challenge is how adaptation is going to work. Is there a mechanism to use the data on future projects? The Interagency Ecological Program’s Tidal Wetland Monitoring Project Work Team has developed the IEP tidal wetland monitoring framework which includes several effectiveness monitoring items, including the development of project-specific monitoring plans for effectiveness, and targeting capacity, opportunity, and realized functioning of these tidal wetlands to meet the needs of fish species. They also include encouraging the collection of data to support adaptive management in future projects. Another question is where to store the data. There are several data centers, exchanges, and platforms. There’s a lot going on, but things are not consolidated at this time at all, Dr. Platenkamp noted. 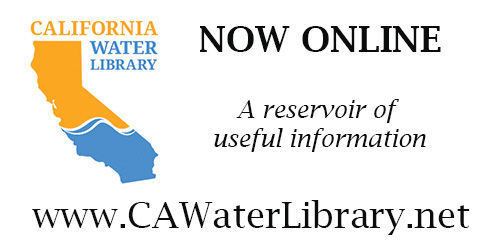 There is also the Delta Restoration Network, a hub being put together by the Delta Conservancy for collecting data and sharing data for different restoration projects. 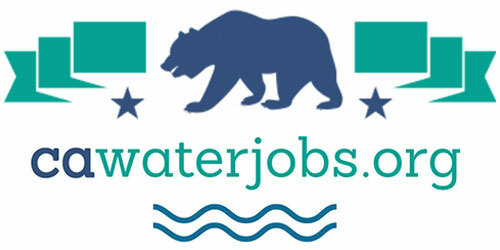 There may be a role for the fish agency strategy team, a group of technical representatives of the fish agencies and the Bureau of Reclamation that determines what the credits are for these tidal marsh restoration projects under the biological opinion; they could take the data from previous projects and apply them to future projects and provide that in their advice and potentially make them requirements for the new projects.